It is almost time to say goodbye. 이제 거의 작별 인사를 할 시간이네요. 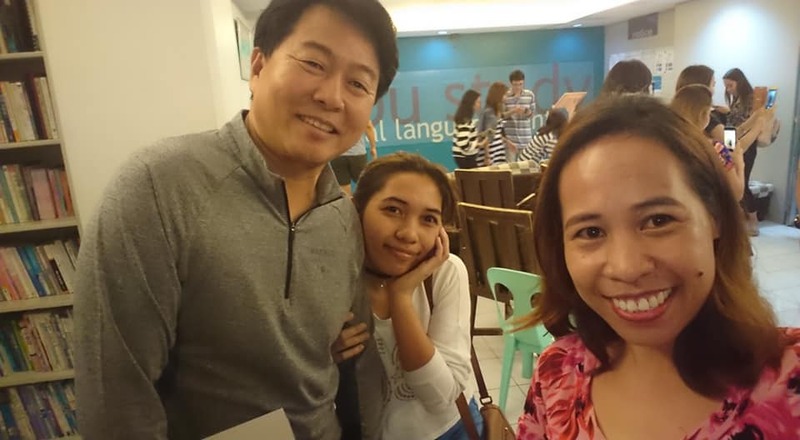 Looking back at the past, I was hesitant to come and study English in Cebu. Why? It’s because I needed to adjust to the new environment and the people who will surround me. Sometimes, it made me felt scared but I always looked forward for the better outcome of my study here. When the time came that I was already here, my classmates and teachers always encouraged me to study English well. They helped me forget my loneliness by cheering my up. For this reason, I thank them for their words of encouragement. 돌이켜보면, 저는 세부스터디에 와서 영어 공부를 하는 것을 머뭇거렸었습니다. 왜냐고요? 새로운 환경에도 그리고 새로 알게 될 사람들에게도 적응을 해야 하니까요. 가끔씩은 걱정을 하기도 했는데, 한편으로는 영어 공부를 해서 좋은 성과를 얻고 싶었습니다. 그런데 제가 세부스터디에 딱 왔을 때 선생님들과 학우들이 제가 공부를 열심히 할 수 있도록 힘을 보태 주었습니다. 덕분에 저는 외로움을 느끼지 못했습니다. 저에게 힘을 주신 그들에게 감사의 인사를 드립니다. At this moment, let me leave a wonderful message to my teachers and friends. 이제, 선생님들과 친구들에게 메시지를 남길 시간입니다. Teacher Zam. She is a funny and attractive woman. In her class, our group mates, Andy and Peter, were perfect to communicate English as far as I feel. 잼 선생님. 선생님은 아주 재미있고 매력적인 여성입니다. 또한 선생님의 수업에서 저의 학우였던 앤디와 피터는 제가 느끼기에 영어 소통을 아주 완벽하게 해냈습니다. Teacher Frank. In his class, I’ve watched good movies. It’s helpful for me to learn English especially in developing my listening skills and slang words. 프랭크 선생님. 선생님의 수업에서는 좋은 영화들을 봤습니다. 그게 제가 영어 공부를 하는데 큰 도움을 주었습니다. 특히 영어 리스닝 실력이 늘었고, 슬랭들을 배웠습니다. 로나 선생님. 선생님의 발음은 거의 미국 네이티브와 같았습니다. 선생님의 “Let’s start” 발음을 잊을 수가 없을 거예요. Teacher Shammy. Her grammar class was difficult for me but then again, she made me understand everything easily. In some point of our grammar lesson, we practiced repeatedly in order to use the hard expressions. However now I can’t say I’m much better than before. 샤메이 선생님. 선생님의 문법 수업은 저에게 어려웠어요. 그런데 선생님은 제가 모든 것을 쉽게 이해할 수 있게 해 주셨습니다. 우리는 문법 수업 중에, 어떤 어려운 표현이 나오면 반복적으로 계속 연습을 했어요. 그렇지만 제가 예전보다 훨씬 나아졌다고 말할 수는 없겠네요. Teacher Cenif. She was funny and we talked about all kinds of things in life: love, friendship and so on. 세니프 선생님. 선생님은 정말 재미있고, 우리는 인생에 온갖 문제에 관해서 다 이야기를 했습니다. 사랑, 우정 그리고 많은 것들에 관해서요. Teacher Raquel. My strength in the afternoon class was almost drained but she always made me happy during our class time. Because of her vocabulary class, I got a perfect score in a monthly vocabulary test. Raquel 선생님. 저는 오후 수업이 되면 힘이 다 빠졌습니다. 하지만 선생님께서 저를 수업 시간마다 즐겁게 해 주셨습니다. 선생님의 어휘 수업 덕분에, 저는 월간 어휘 시험에서 만점을 받기도 했습니다. Lastly, Teacher Noreen. She helped me improve my speaking skills. Her class is very difficult for me to express in English but she waited for me until I finally arranged my thoughts before I was going to share my ideas. 마지막으로 노린 선생님. 선생님은 제가 스피킹 실력을 향상시키는데 도움을 주셨습니다. 선생님의 수업 시간에 영어로 표현하는 것은 어려웠지만, 선생님은 항상 제가 말하기 전에 생각을 정리할 수 있도록 기다려 주셨습니다. To my classmates and friends. 저와 함께 공부한 학우들과 친구분들에게. My friends who already graduated (Hanna, Sunny and Young) advised me to enjoy studying English when I was a new student here before. Indeed, they made me feel comfortable living in this academy. 제가 처음 이곳에 학생으로 왔을 때, 세부스터디에서 이미 졸업한 친구들 한나, 써니, 영은 저에게 영어 공부하는 것을 즐기라고 조언해 주셨습니다. 참으로 그분들은 제가 이 학원에서 편안하게 지낼 수 있도록 도와주셨습니다. Last but not least, Andy, Simon, Peter, Shawn, Amber and special friends Le and Power. They are my friends in Cebustudy. I am grateful to be with them. We were studying together, diving and having a party as well. Apparently, I was grateful to them because I acquired a precious experience during my studying here. 마지막으로 그러나 아주 중요한 분들인 앤디, 사이먼, 피터, 션, 앰버, 그리고 특별한 친구들인 리와 파워. 그분들은 세부스터디에서 저의 친구들입니다. 그들과 함께 할 수 있어서 정말 감사했습니다. 우리는 함께 공부하고, 다이빙하고, 그리고 파티도 했습니다. 정말로 그분들께 감사드립니다. 덕분에 이곳에서 공부하는 동안 소중한 경험을 얻었습니다. To sum up, studying English and creating good friendship with the other students at the same time definitely gave me wonderful memories to keep forever in my life. If I have another chance to learn English, it must be in Cebustudy with my family. 간략히 말씀드리겠습니다. 영어 공부를 하고 동시에 친구들과 우정을 나누는 것은 저에게 평생 기억할 수 있는 환상적인 추억들을 만들어 주었습니다. 만약 제가 영어 공부를 할 기회를 다시 얻게 된다면, 세부스터디에서 가족들과 함께 시간을 보낼 것입니다.